If you enter Centre Georges Pompidou, a cultural complex in the 4th arrondissement of Paris, and you wander around the basement, you may run across the clock represented on the right. The device looks rather standard, except for the colorful cogs, perhaps shown here as an echo of the high-tech architecture of the whole building. Another oddity you might notice is the LED display which gives a digital indication of the time, and a mysterious 3 digit number next to an "at" symbol. 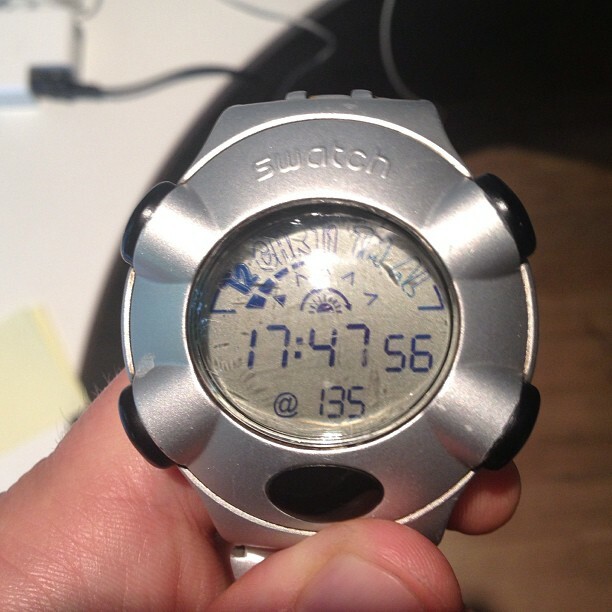 This combination ("@ 452") corresponds to a new way to display time, envisioned by Swatch, a Swiss watch company. The idea was to divide up the mean solar day up into 1000 parts called ".beats" (which means that a ".beat" last 26.4 seconds). Each day begins at @000 .beats, which actually corresponds to midnight in Switzerland (CET: Central European Time) and the Internet noon is thus @500 (3am in San Francisco, 6am in New York). 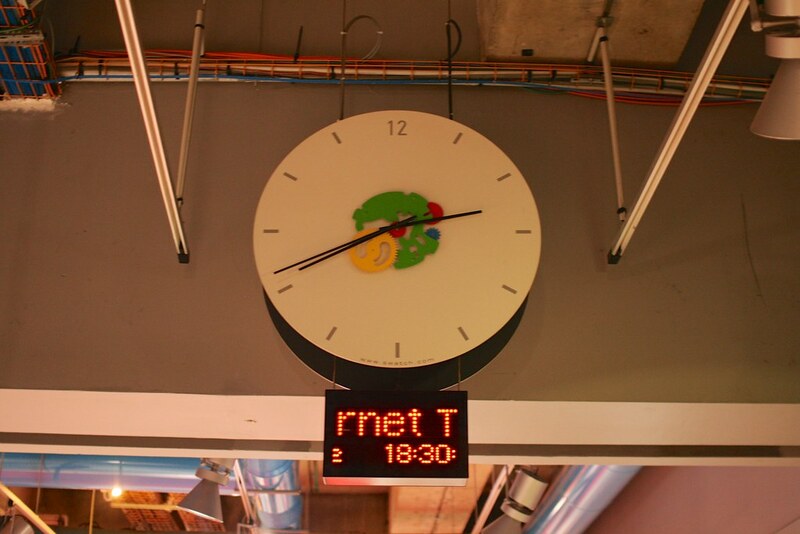 This simply means there are no time zones, and only time scale called "Biel Mean Time" (BMT), based on the city where the company's headquarters are located. Besides this big clock, one may find such .beats on Swatch watches as well certain cell phone models, a video game and Linux GUIs. Apart from the company website, this "new" time display is now quite uncommon, but it should not prevent us to wonder about its origin as well as its cultural implications. "The gathering of more than ninety children aged 10 to 16 from 54 countries was organized to discuss technology's impact on the younger generation. Swatch is a major sponsor of the Lab and has been for about five years. The idea was that far-flung people would use Internet Time to coordinate their schedules and socializing"
Also, this new time standard was supposed to be used for the Nation.1 project, a conceptual country based on the Internet and owned, populated and governed by the children of the world (!). Aside from this intriguing origin, this "internet time" based on .beats is interesting from a cultural perspective for various reasons. 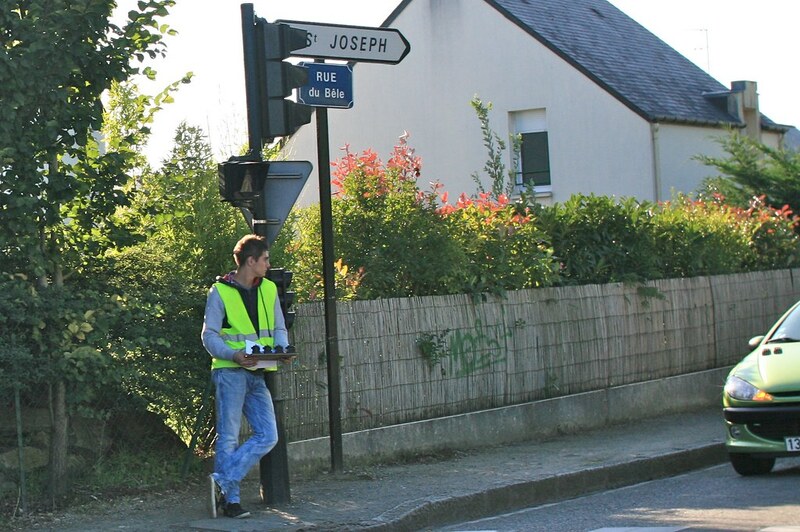 First, it is important to frame this project as one of the many initiatives to measure and manage time. Over the course of history, scientific and technical discoveries have led to the design of curious apparatuses to display the "passage of time". Think about how sand, oil, candles, ropes, sticks, mechanical pieces or nuclear technologies have enabled this. It's thus not surprising to see "the Internet" as part of an assemblage devoted to measuring time. However, unlike the usage of sand or oil to measure time, the idea here is not to use the technology (network infrastructure). The point is, instead, to benefit from the sort of temporal synchronicity created by the usage of internet platforms (email, Web, etc.) and claim the importance to live in a similar timeframe. Swatch internet time was meant to get rid of time differences and have a common reference. Said differently, it's as if the Swiss company had declared local time and place irrelevant. This is all good and nice except for a fact: the "origin" .beat (@ 000) corresponds to where their headquarters are located, which is not exactly very egalitarian. Nevertheless, even if this "internet time" sounds curious and may have looked cool, this new time format suffered from path-dependence: " how the set of decisions one faces for any given circumstance is limited by the decisions one has made in the past, even though past circumstances may no longer be relevant". This phenomenon seems always an issue when it comes to changing people's habits. Why do I blog this? documenting the subtleties of our everyday life. Last week I gave a two-days workshop about design research. It was part of a week-long seminar aimed at masters students from the two local design schools (HEAD–Genève and ECAL). We went through a quite intense set of activities ranging from lectures to drawing sessions, visit to the library, long arguments and exquisite corpse-like activities. My first objective was to describe what design research is, and the second to help students come up with "the research question", which looks like a Holy Grail for lots of them. We had various conversations about what research is, and how it's related to design. In doing so, lots of issues bubbled up to the surface and it was strikingly intriguing to list them. I took some notes about these and I turned it into a short presentation about the misconceptions about design research. Design research is what's produced when you don't have a client. It's personal project Well, this was a common perspective offered by students at the beginning. As we discussed, it seems that the way "research" is used in some of the participants' background lead them to think that we do research only when there's no problem to solve, no brief from a client. Research, in the academic sense, is about generating knowledge. What does it mean in a design context? Well, this quote by Bruce Archer express differently: “Design Research is a systematic search for and acquisition of knowledge related to design and design activity.” It's also a misconception because research projects are not done in a vacuum: there's a need to refer to the existing knowledge produced by other researchers, and funding bodies definitely influence what they want to fund. Also research can be "personal" but in general there's more than one person involved (colleagues, research partners...). Design leads to artifacts (products) it doesn't produce theories. Yes, design produces artifacts but it doesn't mean that you cannot derive/generate theoretical insights based on this. The way objects are used, produced, repurposed can offer various perspectives that can be turned into different levels of theories, as showed by this quote from Alain Findeli: "due to his/her involvement in the object, the researcher will raise new questions, discover new approaches, and if he/she has talent, produce new theoretical models. I propose to call this method project-driven research". To discuss what it means practically, we used "￼Strong Concepts: Intermediate-Level Knowledge in Interaction Design Research" by Höök and Löwgren to discuss this. The paper describes a spectrum of knowledge one can abstract from particular design instances. Design research produces bad design. What designers express with this is their disappointment when they see the outcome of design research projects: artifacts which are not in line with the Zeitgeist or with tacit design criteria; and of course it's also related with certain fonts used on researchers slides, the lack of attention to certain graphic details (someone in class wondered about the 2-columns ACM template) and, above all, the fact that artifacts they see do not correspond to their level of expectations as designers (regardless of the theoretical insights produced). That's a good one as it's not so much of a misconception. There's indeed a lot of bad design outputs in design research and the community needs to do better. However, there are lots of exceptions to this and, the fact that artifacts produced by design researchers are bad does not mean that one cannot do better! As examples, we looked at various cases: Auger-Loizeau's Carnivorous Robots, Fabian Hemmert's work, as well as our own Curious Rituals. Why do I blog this? Nothing better than a skeptical audience to learn how to frame your research topic/contribution. This seminar was highly stimulating. Plus, these misconceptions are interesting not only because there's a need to correct then. Most of them reveal how research is normative and it's sometimes good to push the boundaries a little bit! Data science and “methodolatry”, the aestheticization and idolization of method. "Methodolatry and the Art of Measure by Shannon Mattern is an interesting piece that Jan sent me this morning. It addresses the implications of "urban data science", i.e. citizen scientists, public labs, urban explorers, infrastructural tourists generating and collecting their own data on one end of the spectrum, civic hackers on the other. Both share the same "way of conceptualizing and operationalizing the city" and an "instrumental rationality/solutionism”... what the author calls “methodolatry,” the aestheticization and idolization of method. The author describes how the relationships between the urban environment and data with different historical pointers showing how cities are "'machine' for efficient circulation". She also refers to different claims by Lewis Munford, Friedrick Kittler and Ola Söderström which are quite relevant. "Is there an ethos, a value system, driving these data-generated processes, or is it all just algorithms? Of course, we wouldn’t say that there’s no ideology inherent in the algorithms themselves, but the computers powering these Big Data projects run billions of operations that cumulatively produce substantive transformations in the urban landscape, with little regard for underlying values (...) sometimes the most readily apparent or accessible way — for students in particular — to gain entry to those complex practices is to take on the aesthetics of measurement: to devise a clever data collection system, to accumulate a reassuringly big pile of data, and to massage that data into a persuasive visualization. That’s a worrisome trend. This isn’t to say that engagement with the affective or stylistic dimensions of measurement precludes engagement with its larger methodological functions; Feyerabend has shown us otherwise. Rather, I hope these concerns are brought into alignment: that the methodological packaging suits the purpose, the form serves the function, the knolling serves the knowledge. (...) perhaps these methodolatrous projects, in their aestheticization of measurement, are calling our attention to presumptions about scientific rigor, parodying our algorithmic impulses, tacitly asking questions about the ideology of a pervasive culture of measurement and assessment. Perhaps, despite their implicit alliance with CUSP and Cisco and the like, our citizen data gatherers want to highlight the “givenness,” the rhetorical nature of that data, to show its inherent irrationality, to demonstrate that the “science of cities” is also, necessarily, an art." Why do I blog this? An interesting addition to the debates about data science and smart cities. Certainly a good complement to Adam Greenfield's "Against the Smart City". Being a reggae/dub amateur for quite some time, I always wanted to write about it. The lack of time, and the remote character of this topic wrt to other interests made me postpone this for a long time. 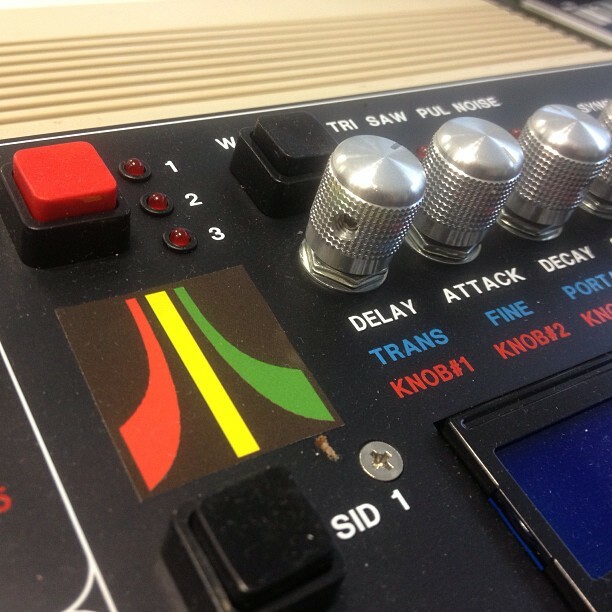 Last year, I started becoming intrigued by a sub-genre where artists play reggae with 8-bit machines... and I thought this would be a peculiar research topic for the Geneva bureau of the Laboratory. So... after conducting a series of interview with musicians, a copious literature review about the history of reggae/chiptune and an analysis of technological artifacts used by performers (things like modified C64 SID turned into dub machines)... it seems the final correction has been made on the "8-bit reggae" manuscript and Etienne (Editions Volumiques) is currently working on the page layout. The idea is to have a paper-booklet on which the reader can use his phone to access media content (music, video); without a QR code (this is important as I find them annoying). To be released at the beginning of 2014! The book is a description of how the world of reggae/dub collided with the one of video games... and how it led the birth of an intriguing, and original form of culture. It's the occasion to introduce the idea of "machine creolization" – the role of machines/algorithms in the hybridization of culture – an important feature of contemporary culture. The effort is now on working on other projects related with this concept. Talking about the book project recently, I've been asked several times if I could give "an introduction" or "a playlist" to this subgenre, here it is! Jahtari X Uprooted Sunshine: Level Up! Why do I blog this? Update on a project rarely mentioned on this blog!